Will the Smartphone controlled First Person View Drone transform how emergency services respond to major incidents and open their eyes to the 3G Video opportunity? It’s long been amazed me that mobile operators who have invested billions buying licenses and building out their 3G networks haven’t yet woken up the huge opportunity they have to enable members of the public to make video calls to emergency services and provide preferential ‘always best connected’ access for these callers. 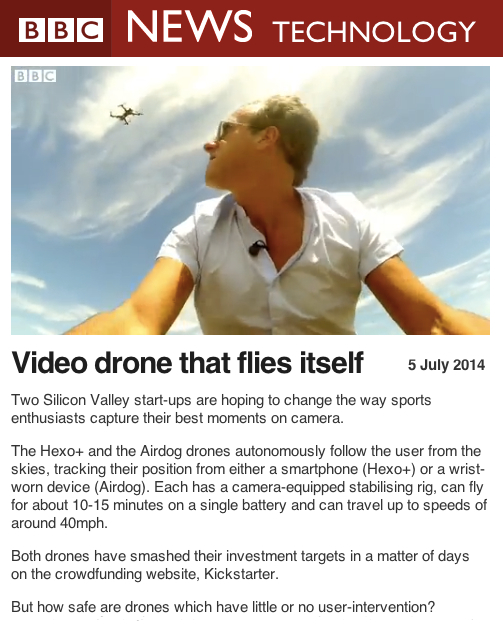 Wondering what was going to cause this idea to take off and from watching this first youtube video made by Robert Scoble with the new DJI Phantom Vision 2 Drone (that retails at just $1000 and can be carried in a small holdall) it turns out it might be something that does actually ‘take off’. 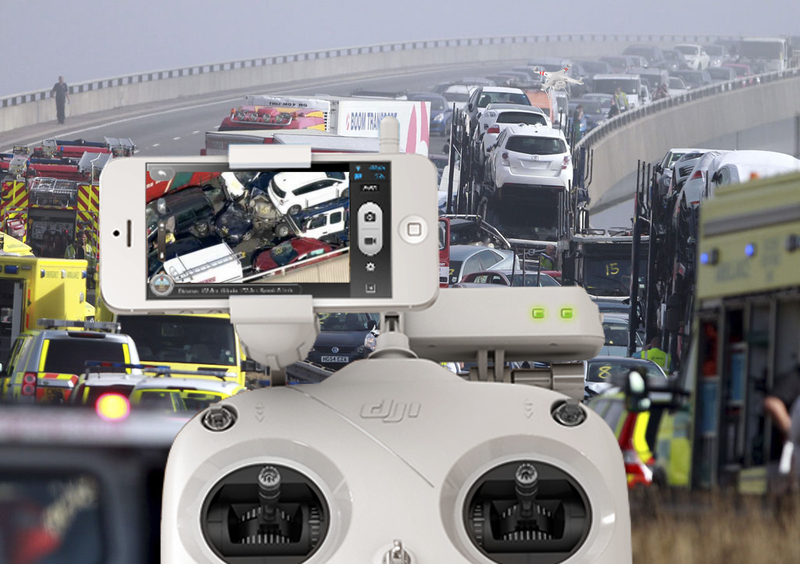 It really can’t be long before all major motorway incidents are video recorded using such low cost easy to use technology because for one thing the insurance companies would see the cost of making it available to major incident teams as negligible (eg. more money will be spent on the cones that they are having placed on the road). As soon as that’s happening it’s only going to be logical to send the recording to the emergency services response team (so they can better assess the response requirements) and then I think it’s going to be all too obvious that with plain old voice calls that the public are using we’re ignoring huge opportunities for getting insights and collecting evidence in emergency situations. 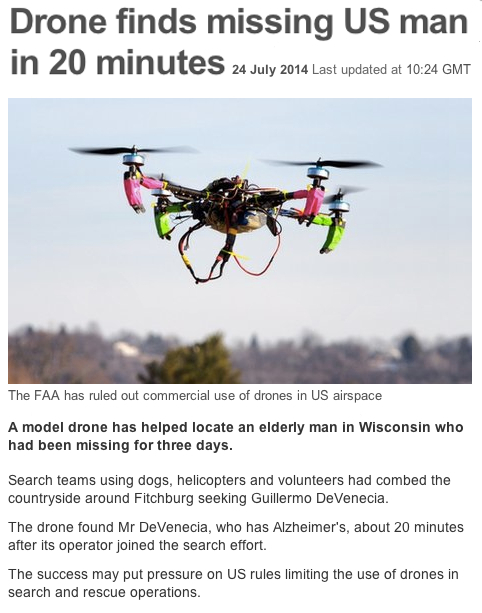 The BBC is reporting that a drone belonging to a concerned volunteer located within 20 minutes an elderly Alzheimer’s Patient who had gone missing 3 days before. Incredibly a Wisconsin search team had been using dogs, helicopters and volunteers to comb the countryside until drone enthusiast David Lesh who had been visiting the area joined the community wide search effort. This week Dublin Fire crews have announced they’ve now got drones to help them get better views of fires they’re fighting. Over at the Consumer Electronics Show in Las Vegas (where there was a much bigger presence of mHealth tech than previous years and Qualcomm made clear their intentions to shake the market up the Drone market with their latest smartphone chips and a big investment in 3DR) Chinese drone manufacturer eHang announced the world’s first autonomous drone capable of carrying a passenger. The video is really cool but can you imagine how much more powerful the impression it would make if it had DEMS (Drone Emergency Medical Service) branding and the video showed it being used to fly out empty to pick an injured skier up in dense fog on the mountain? The new Hover Camera Passport at $599 (HatTip: Dr Chris Bickford) really shows how quickly this market is evolving. mHealth applications can even change our perception of ‘disco dog coats’ but can you imagine if the Hover Camera promotional video featured an Emergency Service team arriving on the scene of an emergency and using the tech to deploy live aerial video surveillance in seconds? Swedish researchers found that drones with defibs arrived on average 16.5 mins quicker than EMS.